Although a lot of friends and family read my blog, my main group of readers are overseas. I try to keep the blog informative and fun. Unfortunately I have someone reading my blog that has a great deal of ill will toward me and my family. In an effort to protect my family I will not be posting about my kids or grand kids. I love them and they are much more important to me than any of the things I am involved in and if anyone that wants to have a relationship with any of us, they need to do so and not troll my blog and then send things in a mysterious manner - this is not the day and age to do that. So if you and I are friends you will be in the know and will not need to keep up with the personal details on my blog. I hope this is clear enough. Enough said . On to more pleasant things! Tonight I am working on a new to me embroidery tool:, the punch needle, I am planning on doing a humming bird body for my Yellow Color study. 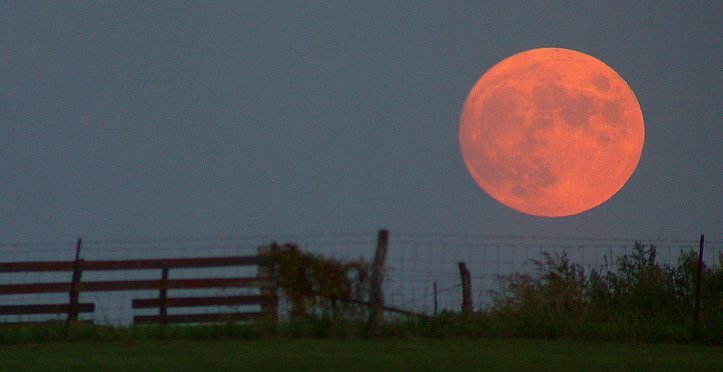 And snapping a few pictures of the Strawberry moon! Thanks for stopping by and for all of you that leave me sweet comments and emails that encourage, Thank you I really appreciate it!! Lord bless dear Ginny and may He deal with all things in respect to this after His will.. Sorry indeed to read it, but oh I love Gids great creation what an amazing moon shot! An amazing picture of the moon. Don't the colors go beautifully together? God is a great artist! Sorry about the problems. Hugs. Oh Ginny, I hear you - I have had a few nasty experiences through my blog too - praying God will resolve this, and I agree, family is way to precious to expose to this nonsense. Love the colours in your photograph - God's palette is always perfect! Oh wow, what a beautiful photo, Ginny! A strawberry moon it is. And, I'm so sorry to hear that you have had some internet trolls lately. That is just awful. I haven't had to deal with anything nasty yet on my blog and I hope I never do, but my thoughts are with you! Miss you lots!